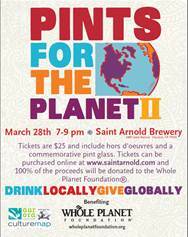 On Wednesday, March 28th from 7:00pm ~ 9:00pm, Saint Arnold Brewing will be host to the second annual Pints for the Planet which benefits the Whole Planet Foundation. Founded in 2005, Whole Planet Foundation is a Whole Foods Market foundation that funds poverty alleviation worldwide where the company sources products. The nonprofit’s mission is to empower the poor living in developing-world communities with microcredit and the chance to create or expand a home-based business and lift themselves and their families out of poverty. Tickets, which include hors d'oeuvres and a commemorative pint glass, are available for purchase online for $25 each with 100% of the proceeds going to the foundation.